I used to struggle a lot with anxiety. But over the last bunch of years, I haven’t. I changed a lot of things about the way I live (learn more here) and now B”H I’m actually quite a calm person. But occasionally the anxiety comes back. Like it did this morning. I woke up with an out-of-the-blue panicky feeling, breathing quick and shallow, feeling like I was running around like a dog after his tail as I zippered Tsofia’s coat, found Yaakov’s rain boots, handed Yoni his grilled-cheese sandwich and set out for gan in the downpour. Then I came home, and like always, I went to lie down and davened and ate breakfast, but the quick and shallow breathing was still there. Like I was under terrible stress…which was strange, since I didn’t really have anything to be particularly stressed about. I looked over my to-do lists–two in the kitchen, and two by the computer upstairs, and then I wrote up another to-do list of all the things from my four to-do lists that I must do today. And then I went out to get a padded envelope to mail my sister a present for her new baby, Ezra, and to pick up something from the grocery and the computer store. I tried to imagine where the anxiety was located in my body, and I saw in my minds eye that it was sitting at the very top of chest, underneath my throat. And I tried to imagine what it looked like, and I saw that it was a massive, metallic, purple/black rock with bumps all over, like a bunch of grapes. For the last few weeks Rabbi Nivin has been teaching us about anxiety, and getting rid of it. And he explained something that blew my mind. 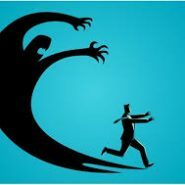 Our anxiety is actually trying to help us, brought in by our emotional “Protector,” to make us focus obsessively on the things the Protector wants us to notice, to stay in control of. And that’s what I did…And b”H, it worked. Not long after that, the purple-black rock and my Protector left me alone, in peace. Love this post. Thanks for sharing this concept and illistrating how it works. So cool you anxiety kept his end of the deal!